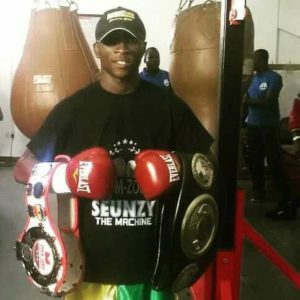 Undefeated Nigeria Super Featherweight boxer, Oluwaseun ‘Sensational’ Wahab has vowed to remain undefeated after he fights Abraham Nova in New York next month. Wahab is set to make his US debut in an eight-round affair against the Puerto Rico-born Nova at Main Street Armory, Rochester on February 1. Wahab, who is based in Ghana, beat Tanzanian Issa Nampepeche in the headline fight of GOtv Boxing Night 17 in December to win the vacant World Boxing Federation (WBF) Intercontinental Super Featherweight title in his first fight in Nigeria. The 28 year-old, mentored by Ghanaian International Boxing Hall of Famer Azumah Nelson, made his professional debut in 2014 against Mark Okine in Accra and remains undefeated in 18 fights with 11 fights ending via knockouts. 25 year-old Nova, a former number one-ranked amateur in US, is also undefeated. He has fought 14 times and 10 of the fights ended with knockouts. He made his professional debut in 2016 and is currently the North American Boxing Association (NABA) Super Featherweight champion.